Where do I use my Golden Tours voucher code? Select a code from us and copy it. Follow the link to the Golden Tours website. Select your tour, activity or attraction. Choose your tickets and press continue. Fill in your dates and click ‘Book Now’. You can then ‘Proceed to Checkout’. On this page, you’ll see ‘I have a promo code’ heading. Click on this, paste your code into the box that appears and click ‘Apply’. Established in 1984, Golden Tours are the experts of London, providing top quality tours around the city and day trips to the best UK locations. Golden tours can take you anywhere from Stonehenge to Bath to Harry Potter World and with over 30 years of experience and an unrivalled range of top-quality London tours you can be assured that your Golden tour will be a success. Golden Tours are in proud partnership with the internationally renowned Gray Line Association and preferred partners of Warner Bros. Studio Tour London, with tours available for adults of all ages, children, history enthusiasts and sightseers in many different destinations. 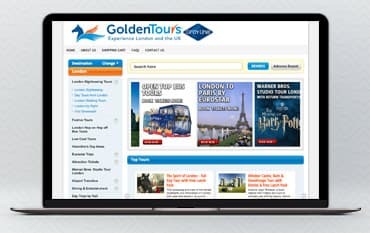 Golden Tours have a safe and secure website, they are passionate about customer care and have carried over 10 million guests from hundreds of countries around the world. Value for money, informative guides and luxurious travel are guaranteed. Golden tours vast range of products include day trips, their own personalised Hop-on-Hop-off bus service, attraction tickets, theatre tickets, walking tours and airport transfers. Golden Tours are your one-stop-shop for everything you need in London and the UK. Golden tours is a London Based sightseeing company that offer plenty of Guided Tours of London designed for you to explore the sites in England’s historic Capital City. All tours include a guide and cover the wide range of landmarks and attractions across London, they even offer a night tour visiting some of the spooky secrets in a grisly Jack the Ripper tour. Or, in contrast, you can also seek out the Royal family and learn about their past in the City tour as you admire the wonderful political, historical and royal monuments and buildings that are scattered around the booming city of London. Golden tours London are the perfect opportunity for you to see London in all its glory and diversity. Hop on hop off tours are the perfect solution to seeing the city of London without traipsing around the busy streets with a difficult map, trying to decipher where you are and where you’re going. Once you hop on the bus tour you get an easy, guided tour of London with a view! Take a seat on the top deck of the bus and get ready to surround yourself with the intoxicating sights and sounds of London. Not only will you get to see London’s main points of interest you’ll also get your bearings and a feel for what London’s about, especially if it’s your first time in the city. If you’ve been to London before hopping on hop off tours will offer you a deeper insight into the monuments and sights around the city and the background and history of this wonderful place. And, you're not just restricted to the bus! If you choose the flexible hop on hop off tours you can ride the buses at your own pace, admiring the views from the top of the bus and also independently exploring London. Join the magic with Harry Potter Studio tours. Explore behind the scenes of the phenomenal films and discover how the witchcraft and wizardry were brought to life on the big screen. Feel apart of Hogwarts as you admire the endless props, sets and costumes and uncover the secret of the special effects and CGI used to create the remarkable mysteries like the Quidditch games and the powers of the invisibility cloak. Visit Diagon Alley where you can find all the amazing magical shops that appear on Harry Potter. Are you daring enough to try Bertie Bott’s every flavour beans? Which wand will choose you? Buy a chocolate frog and your very own Hogwarts cloak and watch the magic come to life before your very eyes in Harry Potter Studio Tours. Once I Have Booked, Can I Ammend my Booking? Golden Tours Tickets may only be altered if you hva ebooked a Coach tour. You will need to call the customer service team up to 24 hours before your departure date and time in order to make any necessary amendments. Changes cannot be made to entrance tickets, theatre tickets, rail trip or the Warner Bros Studio Tour. If you wish to cancel your Full or Half Day coach tour, you may do so within 24 hours before your cpach departs. If you cancel any later than this, you will not recieve a refund. Fast-track entrance tickets, open top bus tours, theatre tickets, rail trips, Warner Bros Studio Tours, Overnight Tours plus lunch and dinner products canno be cancelled once booked. For more Frequently Asked Question, see the Golden Tours FAQ section here. Fnd more contact details and an online enquiry form here. Plan your London trip by choosing from a range of sightseeing tours, day trips and things to do in London with Golden Tours. Why not use our Golden Tours Promotional Codes to save even more money on your purchase? Golden Tours specialise in London Sightseeing and UK tourism. Providing high-quality London tours, attraction tickets and day trips to other incredible destinations in England, such as Stonehenge, Bath, Oxford and The Cotswolds. Or why not take an open-top hop on hop off bus? It’s an easy and convenient way to see the city and take in all the iconic London sights. We are constantly on the hunt for Promotional Codes for Golden Tours to help you with your money saving. Our experts check dozens of sites for secret codes including NHS discounts, student sites & social media channels saving you time & money!